What if a veterinary visit could be something you and your pet look forward to? 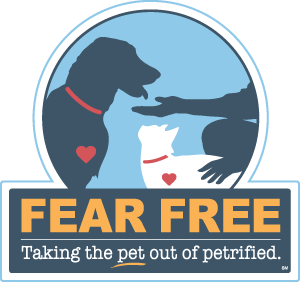 Fear Free was founded in 2016 by closely listening to the needs of veterinary professionals as well as those of pet owners. It has become one of the single most transformative initiatives in the history of companion animal practice, provided unparalleled education on emotional well-being, enrichment and the reduction of fear, anxiety and stress in pets. We practice Fear Free methods on both our canine and feline patients. Why? Simple, because it’s better medicine. Psychological stress slows the healing process. It skews results of blood test and vital sign readings. When pets are happy and calm instead of fearful, anxious, and stressed, the physical exam and blood chemistry yields better information. When a pet is feeling stress, his or her owner’s level of stress will usually increase as well, which only serves to further increase the fear, anxiety, and stress in the pet. Fear has been shown to cause mental and physical illness in bother people and animals. The Veterinarians of the Animal Health Clinic are Certified Fear Free Professionals as well as many of the technicians and customer service representatives. Our goal for 2019 is to meet the elevated standards established to become a Certified Fear-Free Veterinary Hospital.